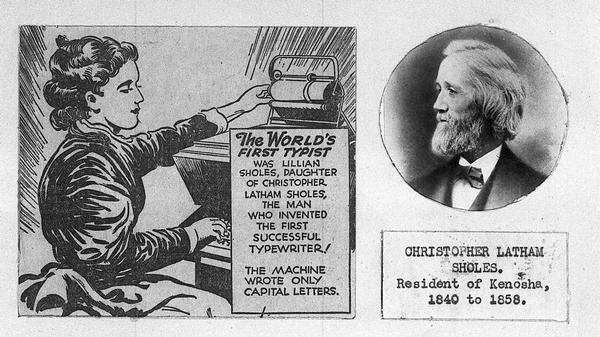 The World's First Typist, Lillian Sholes, daughter of Christopher Sholes, who invented the first successful typewriter. It was during Mr. Sholes' residence in Kenosha (he resided there from 1840-1858) that he invented the typewriter. Mr. Sholes was the founder of "Southport Telegraph," and the first paper was issued June 16, 1840. Source C.E. Dewey, Kenosha Historical Society.